After all these years, Steven Spielberg finally graduates up to doing animation... but not your typical Disney/Pixar style. Instead he's opted for motion-capture, where actors are filmed and their motions transposed into digital avatars. The first Tintin movie is an amalgam of several of the comics, mostly from the Secret of the Unicorn. 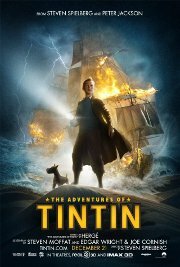 It introduces Tintin and shows how he met Captain Haddock, while seeking to unravel the secrets of the treasure map that he found in a model ship. The past meets the present as they do battle with evil men after the same thing. This film is releasing in both 2D and 3D, this is the 3D version. Action, Adventure, Animated, Detective/Mystery, Family, Fantasy. What do you mean, you don't have a GPS?